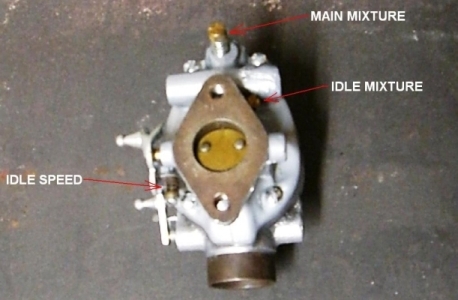 This rebuild is based on the original type Marvel/Schebler Carburetor. Many of these tractors have new aftermarket M/S type or replacement Zenith Carbs. The new aftermarket M/S types that I have seen are poor quality. The castings and finishing are often mis-aligned. Holes that are not properly centered in the castings make the parts weak in critical areas. Some people claim the Zenith is an upgrade. Anything will seem like an upgrade when it replaced any dirty, worn-out carb with a clean one. Most of the original or new aftermarket carbs sold for these engines can perform equally well, as long as they are properly checked-out, cleaned, and tuned. The Marvel/Schebler carbs were VERY successful. They were used on a wide variety of vehicles for many years. That is good, there are plenty of used carbs, and replacement parts available. Maybe not so good when many rebuild kits are now "universal" and may not have the proper size jets. 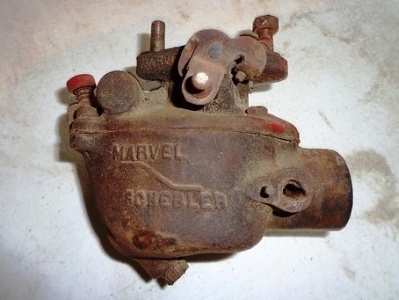 If you are looking for a new or replacement carb for any of the Ford N-Series Tractors, the Marvel/Schebler TSX-241B was the best that Ford engineers came up with for these tractors. 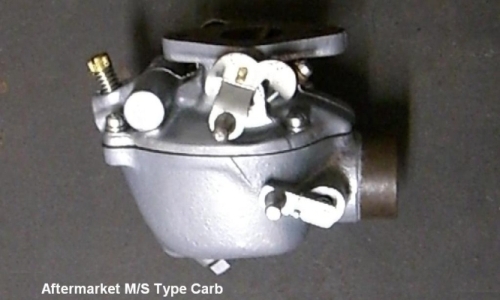 Nearly all of the M/S type carbs can be rebuilt to the TSX-241B specifications. 9N-9510 TSX-33 = 9N carb used on all 9N,2N,8N tractors prior to serial number 8N 260596. 8N-9510 TSX-241B = 8N 313112 and up. 8N-9510 TSX-241C = 8N tractors built late in 1952. Changes made to the 241C that were intended to maximize efficiency caused too many problems. Ford soon issued Service Bulletin 118 with instructions to re-install the econ jet and restore the "241C" carbs back to "241B" specifications. You may need to tap the hole in the top plate to accept the econ jet. 1—Special Screwdrivers—Collect 2 or 3 old useless straight blade screwdrivers and an old dull flat file about 1/2" wide. 2—Grinder—Any type that you can use to make special tools. 3—Pick Tools—Pointy Steel Picks with various bends at the end. 4—Pin Vise—A very small drill bit holder. Usually found at hobby supply stores. 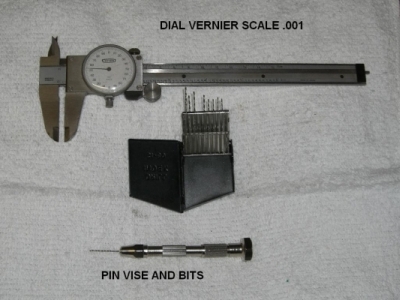 5—Assorted Bits for the Pin Vise in inch sizes from 0.025" to 0.060". The mm size eqivalent is 0.5 to 1.5 in 1/10 mm increments. 7—A selection of wire strands in various sizes that can be threaded through passages to clean them out. Guitar string is my first choice. 8—Precision measuring tool to measure bit and wire sizes. 9—Air Compressor or perhaps canned compressed air to blow out and dry passages. Aside from those; normal hand tools, carb cleaner, PB Blaster, paint thinner, Safety Glasses, etc. A set of flare-nut wrenches may save you from rounding off those soft fuel line fittings. Rubber gloves may be needed depending on what you use for solvents/cleaners, skin sensitivity, and how hands-on you tend to get with that stuff. Wear safety glasses. Carb rebuild kits are available in two versions for the M/S carbs. There is a Basic Kit that should sell for around half what the complete kit costs. The kits are a good deal if you actually need everything in the kit. In most cases, even the basic kit will have more parts than needed. All of the individual gaskets and parts are available for purchase separately. If a kit has new jets, verify that the new jets have the correct size hole before discarding any old jets. 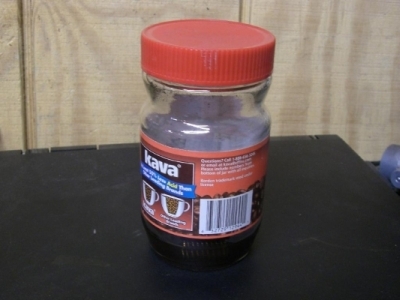 A1—Find a small fuel-resistant plastic or tin container. About quart size should do it. Remove the carb drain bolt and let it drain into the can. When the fuel stops, this should confirm that your fuel valve at the tank actually closes off the fuel completely. If not, you may need a much bigger can, so you can drain the tank and replace the valve. Mission creep strikes again. A2—Remove the fuel line at the carb fitting. Please use a flare nut type wrench, so you don't immediately round off the corners of the nut. A tight-fitting open-end wrench may work ok, as long as the nut wasn't previously tightened by a gorilla. A3—This is a good time to start snapping some photos. Digital photos are free, so there's no reason not to photograph everything as it comes apart. The photos can save a lot of head-scratching later. This is especially true when mission creep sets in, and it's over a year later that you are putting things back together (hint hint). A4—Next remove the linkage and air tube. Linkage rods have spring-loaded ends that fit over a ball joint. Pull the end and rod in opposite directions, the socket should then come right off the ball stud. Loosen the air tube hose clamp at the carb and pull the air tube off. You may need to loosen more of the clamps or even cut the hoses if they are really old. A5—Remove two nuts at the manifold and the carb should drop right off in your hand. Catch it before it hits concrete. It may take a little prying to free the manifold gasket. Use your third hand to do that. The studs should stay in the carb. No need to remove them unless they are damaged and need to be replaced. A6—Take the carb to your work bench. There is usually some fuel still in there (and of course fuel vapor is explosive) so don't light a cigarette yet. Hopefully this carb is in a lot worse condition than any carb you will have to work on. There is no way this one came off a "working tractor". There are always tractors being parted-out on ebay, so that is the best way to get decent original carbs. This one is missing the choke shaft, and judging by the hole where the shaft should be, it will need new shaft bushings. The inside does not look any better. What's left of the choke plate assembly was rattling around inside the carb. 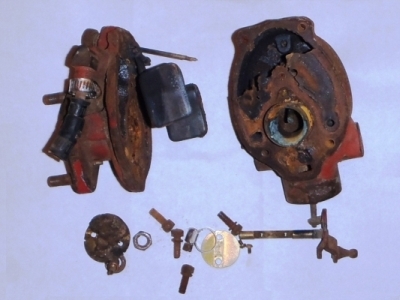 The main mixture screw is frozen, and the carb body screws were rusted in place. Using the proper size screwdriver, I did manage to coax all four body screws out, without damaging the heads. The throttle plate and shaft are brass, so those came out easy. The main nozzle on this carb was so rotten, it snapped off when I tried to loosen it. None of the jets would come out either. I had to drill them all, pick the threads out, and run a tap in every hole. The other carb used in this step-by-step is hopefully much more typical of any carbs you will be working on. B1—If you are certain the carb came off a working tractor, get a piece of paper and take some notes. Count turns as you screw the main mixture and idle mixture screws in until they bottom in the holes. Don't force them, but make sure you are at the limit of travel. Write down those adjustments for info. After recording the settings to the nearest 1/4 turn, remove the adjusting screws and springs completely. The main mixture screw is very long. We are removing it now, so it won't get bent later. B2—Check the idle speed screw. In this case, count turns OUT until the throttle plate is completely closed. That is often hard to get exactly. Don't worry about it too much. B3—Check the choke and throttle shafts for side play in the carb body. If they are tight, there is no need to disassemble and remove them. The seals can be picked out and replaced without removing the shafts. If either shaft has enough wear to be loose, new bushings may need to be installed in the carb body. This requires drilling the casting out to accept the new bushings. If the shafts need to come out, snap photos to document how the plates, screws, and choke springs fit. Carefully remove two screws that hold each plate to the shaft. Pick a new, sharp or specially ground screwdriver that fits tightly in the screw slot. Hold the screwdriver firmly and squarely in the slot and apply just enough force to break the screws loose. Sometimes things will come loose easier if they are first tightened very slightly. Once screws are out, remove the plates, and slide the shafts out. It may be best to assume the carb you are working on has already been rebuilt several times with a wide variety of skill or care. 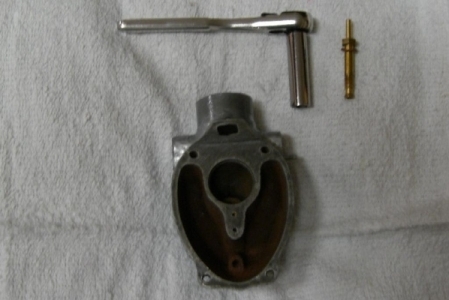 Many carbs rebuilt by previous owners will not have been properly and completely cleaned. Putting new parts in a dirty carb often does not have the desired results. Watch for screw slots that have already been damaged by using the wrong size screwdriver. Some damaged parts can be salvaged. Fasteners such as carb body screws may have been stripped and drilled out for oversize hardware. 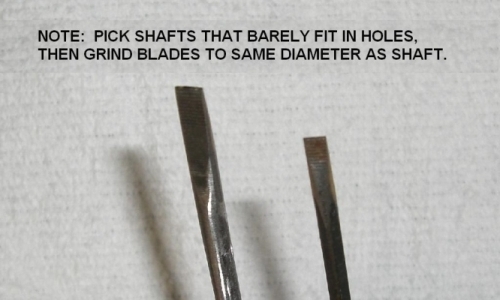 B4—Carefully pry the shaft seals out of the holes with a Pick Tool. The choke shaft seal is a felt washer. The throttle shaft should have a neoprene seal. Sometimes the seals will be behind a metal retainer. Remove the washer seal where the main mixture screw went into the carb. B5—Carefully unscrew the fuel elbow fitting. This fitting is soft and easily bent. I keep a few old fuel line fitting nuts around so I can twist one in the elbow to help support the fitting before putting a wrench on it. Put the wrench inboard as close to the carb as you can get it. The fitting should have a fuel screen on the inside end. If not, make sure it isn't broken off and wadded up inside the carb. B6—Time to remove the carb top. Four corner screws secure the top. Select or grind a screwdriver that fits snug in the slot and hold it in place firmly so you don't damage the screws. These usually come out easy. 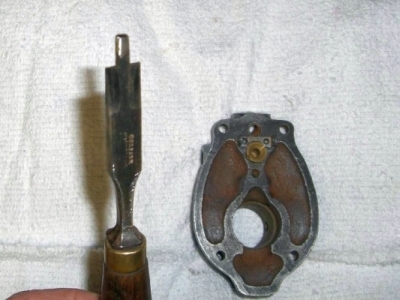 You may need to pry around the edge a bit to separate the bottom half of the carb from the gasket material. You want the gasket to stay with the top of the carb if possible. We will see why in a minute. The float assembly is mostly below the gasket, but it's hinged to the top, so there is less chance of bending something if it all comes out still attached to the carb top. B7—Flip the top over and remove the float hinge pin, float, venturi, and peel the gasket off. Pay close attention to how the venturi (round thing in the middle) is installed in the carb top through the gasket. C1—At this point there is still some disassembly to do, but my workbench is covered in dirt, grime, and bits of old paint. I want to start cleaning the carb, and can't do that right without first cleaning the work area. Spray some carb cleaner in the carb halves and place them where they can soak a bit. Clean up sorting good parts from stuff that will be replaced. I keep all of the old parts until I'm done and don't throw away any parts that appear usable, even if I'm sure they will be replaced. Might need them for the next carb. C2—Before taking them back to the workbench, get the carb halves and other parts as clean as you can inside and out. Use solvents, scrapers, elbow grease, and compressed air in whatever quantity seems appropriate. Drop all the small parts into a glass jar, add some carb cleaner and cap it. Then you can slosh them around gently every time you walk past the workbench. C3—The remaining disassembly is necessary. Some skip it, but it's impossible to get all those little passages completely clean without removing the Main Nozzle and jets. One bit of gum, varnish, or crud left in those passages WILL prevent the rebuilt carb from performing properly. 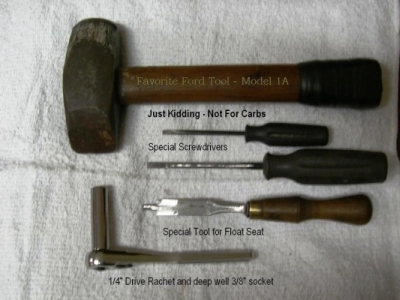 C4—The carb kits usually have a new float seat so remove that (Using special tool No.2). This special tool needs to be wide enough to catch both slots in the Float Valve Seat. It's also nice if it has a pin to keep it centered. An old flat file or a very big screwdriver is a good start for this tool. I have used something as simple as a dime gripped in a pair of vice grips, but a properly-fitted special tool works much better. C5—Removing the Main Nozzle is a bit obvious. A 3/8" 6-point 1/4" drive, deep well socket should be long enough, and thin enough to get on the 3/8" hex. Most 3/8" nut drivers will slip over the Nozzle, but may not provide enough leverage or control to remove the nozzle. C6—As mentioned, the Main Power Jet is under the Main Nozzle. Look down in the hole with a brite light and make sure there is a jet installed. It will come out using the proper size screwdriver. Soak the area in PB Blaster first. Let the PB Blaster work for as long as you can. It may be best to let the PB Blaster work overnight. The proper screwdriver will have a flat blade no wider than the shaft. The shaft and blade should fit snugly in the hole and in the jet slots. There is no substitute for a screwdriver specially-ground to fit. 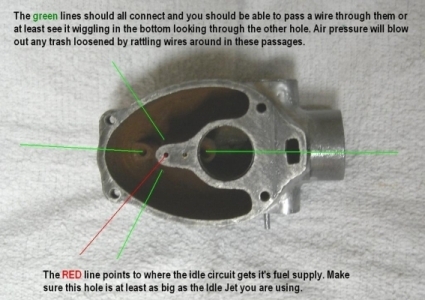 Careful even pressure will release the soft metal jet from the threads in the carb casting without damage. The idea is to remove the jet without having to drill and tap the remains out after wringing the top off. KEEP THE OLD JETS! Toss them in the jar of small parts and give it another swirl. C7—The other two jets are in the carb top. The Idle Jet is easily visible near the float seat. C8—The Economizer Jet is located deep in a hole to one side of the Idle Jet. Similar to removing the Main Jet, you need to use the correct size screwdriver that will reach it. Look down in there first to see if your carb even has this jet. If not, no problem, just run a #8-32 tap into the hole and make sure there are good clean threads for a new jet. You should not be making new threads, just cleaning out threads that are already there. C9—If the shafts were very loose you may need to drill and install new bushings. Most of the wear is often in the shaft, so new shafts and seals might be all you need. If the hole is noticably oval, new bushings are required. Bushings are not provided in kits, but are available separately. D1—Repeat the entire cleaning process. Soaking in solvent will loosen some deposits then a combination of rodding-out and air pressure should thoroughly clean the passages. Cleaning is absolutely the most critical part of any carb rebuild, and where most failures occur. A friend suggested soaking carbs in vinegar for a few days, then soaking in mineral spirits for a few days. That's certainly a lot less expensive than soaking in carb cleaner. I pulled the pieces out a couple of times, to brush away loose paint and dirt. The carb I used to test this process was the really nasty one pictured above. That is not a fair test, but I was still pleased with the result. 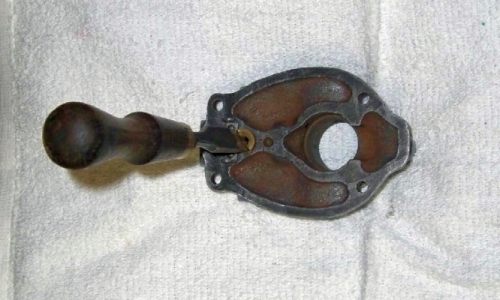 Do rinse thoroughly, until all vinegar smell is completely gone, or the carb will immediately start rusting again. D2—Some of the passages in these carbs may never have been completely drilled out and many of the jets being provided in kits are the wrong size for a Ford tractor. What we want to do is thoroughly clean the carb, and fix anything that may have been wrong. Never assume the carb was right to begin with, especially with aftermarket replacements. 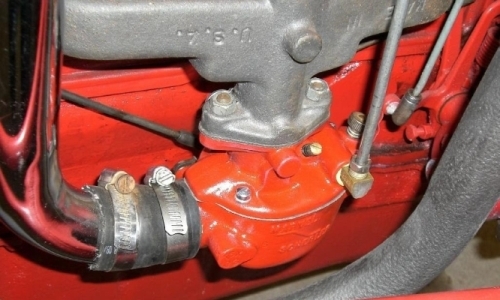 Many of the replacement carbs may not have been made for a Ford tractor. D3—Some people find it necessary to remove the casting plugs to clean and check some passages. I have found that the holes in these carbs can be cleaned working without removing plugs. The shop manual says not to use anything harder than copper wire to clean passages. 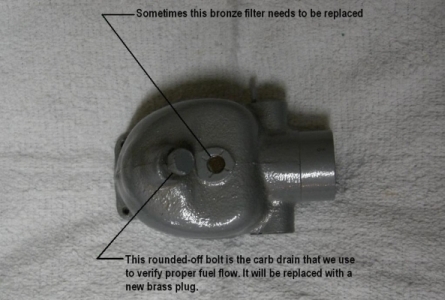 That may be true for an original carb that was built to specifications, but completely false for many replacements. Each passage must be larger than the jet that goes in there, or the passage will restrict flow more than the jet. All of the passages need to be checked, cleaned and possibly drilled out to a size that is larger than the jet. D4—A selection of old wire guitar string in various thicknesses comes in handy for cleaning out passages. It's stiff enough to poke through there, flexible enough to go around corners, and the wire-wound exterior makes a great rasp to help clean out passages. Bending a slight turn in the leading end of the wire will help get it around corners. 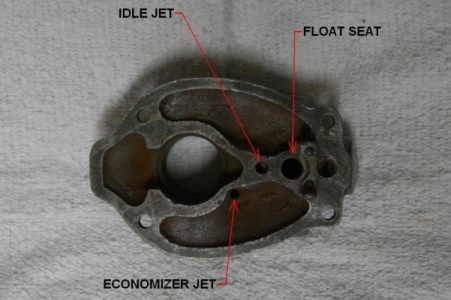 D5—Jet Info - Some rebuilders are convinced that specific sizes for jets work better, but the simple fact is that these carbs had a wide variety of "standard" jet sizes over the many years these tractors were built, and all carbs are basically interchangeable for all 9N, 2N, and 8N tractors. The rebuild kits have introduced even more variations. Unless you are buying a lot more parts than you need, you are going to be stuck with two choices, the jets that came in the carb or the ones provided in a rebuild kit. 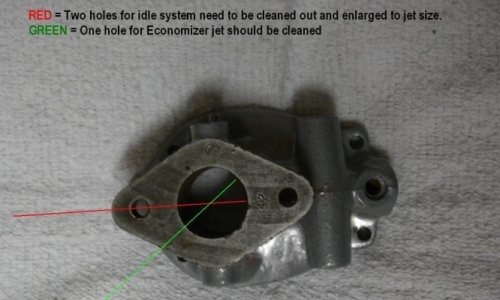 After digging up jet info, then rebuilding and testing a few carbs, it seems that as long as jet sizes are somewhere between the largest and smallest sizes for each jet listed above, the engine will start, adjust, and run well. These are pressure-balanced type carbs, so the engine draws what it needs at the ratio you adjust using the Idle Mixture and Main Mixture screws. The main complaint with these carbs seems to be an idle adjuster that has no effect on the engine. So, don't under-size the idle jet or fail to rod out and open the idle fuel passages. The 241B spec for idle jet is definitely a minimum size. Alcohol blended fuel throws another wrench into the works because the alcohol part is only about half as volatile as gasoline. This would suggest that our fuel jets need to be getting a little bigger as alcohol percentage increases. This isn't a huge issue, in most cases there is enough adjustment in the carb to make it run right. So, without getting too excited about it, I always check jet hole sizes and make sure the Idle jet is at least 0.032", the Economizer Jet is at least 0.046", and the Power Jet is at least 0.050. Any jet larger than 0.050" is tossed in the trash. Any jet smaller than the minimum sizes listed can be drilled out using a pin vise and the appropriate bit. Use drill bits to check sizes, and the correct tool to fix them is ready to go. The chart below is provided in the event something did not come apart as it should. Occasionally, things will be so corroded the only option is to drill out the old material, and pick threads clear. I usually run the correct size tap in each threaded hole as part of the cleaning process even when things come apart with no trouble. 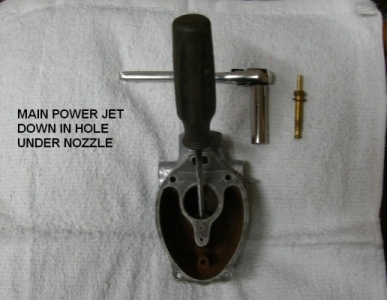 When drilling out old jets or anything else in the carb, there is already a centering hole, so it is fairly easy to keep the drill centered. We still need to stay completely square and perpendicular to the item being drilled. 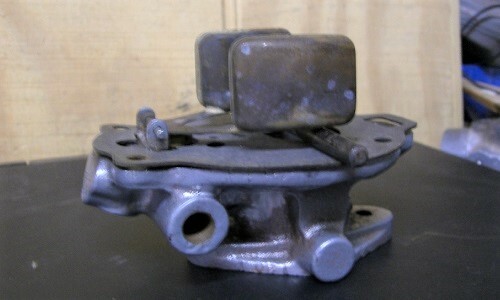 If you have a drill press, some have an accessory vise that can be used to clamp the carb body square to the bit. If you don't have access to shop equipment like that, these carb parts can be carefully drilled-out by hand. It helps that the material being removed is usually softer than the casting around it. Start with a small bit, and work up to the tap bit size indicated for that hole. Most of these carbs have been rebuilt several times by now with the quality of work all over the place. .
E1—Before we start putting things back together, these are soft brass parts going into a cast iron carb body. Most things like jets only need to be snugged down. No need to be a gorilla and wring the threads out of something. E2—Install the correct jet into each hole. I've found this is usually nearly impossible to get wrong. Start with the top cover. The Idle Jet is a larger #10-32 thread and will be the only jet that will thread into the idle jet hole, next to the float seat. 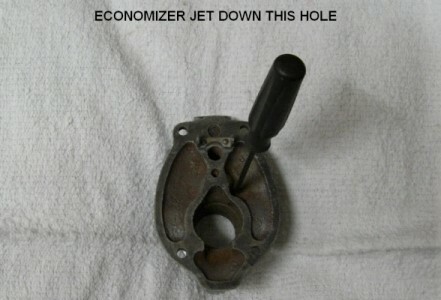 The Economizer jet and the Power jet are threaded the same, but the larger head on the Power jet should not allow it to drop into the hole in the top cover where the Economizer jet goes. Put the economizer jet in and snug it in place. With those installed, that leaves only the Power jet which goes in the lower half of the carb under the Main Nozzle. E3—Install the new float seat with the correct gasket (usually red color). This is where you will need Special Tool No.2 again. All of the new float seats I've installed seemed very hard to get all the way down. They go in a few threads and then get difficult. I did some checking and believe this is another of those issues caused by replacement parts from China that just don't fit. The threads in the carb for the float seat are an obsolete thread specification. The modern equivalent is a 1/8-27 NPS (national pipe straight). Other thread specifications that come close but are not quite right are the 3/8-27 UNS, and 3/8-24 UNF thread. I believe the new seats are being made with a thread spec that is "close" but not exactly right. This would explain why the new seats start to bind after a few turns. Make sure the seat is all the way in and tight on it's gasket. Then drop the float needle into the seat, set the top gasket on, and hang the float in place with the pivot pin. Some floats and valves will use a small clip to help the float pull the valve out of the seat. E3—Check the float adjustment while holding the top of carb upside down. The entire top surface of the float should be parallel with and approximately 1/4" away from the gasket surface. The manual says the top of the float should be between 0.260" amd 0.297" from the gasket surface, using the standard thickness cork gasket. If you cut your own gaskets, make sure you take any change of gasket thickness into account. If you have a good eye, a piece of 1/4" dowel rod makes a great gauge to roll across and measure with. Some screwdriver shafts are 1/4" or you could use a 9/32" drill bit. The actual fractional dimensions closest to the decimal tolerances are 17/64" and 19/64". I don't have drill bits in 64ths, but a 9/32" is right in the middle. The flutes mess me up. 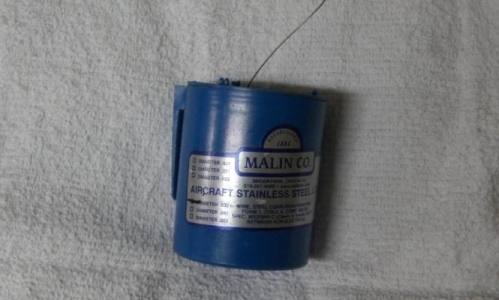 There was once a go—no-go float setting gauge, but I have not found one of those. I find it easiest to use a smooth dowel and estimate that last 1/32". CAREFUL! if this adjustment seems way off STOP, and make sure the seat for the float valve is screwed all the way in. Make sure the float pivot pin hasn't slid off one side. 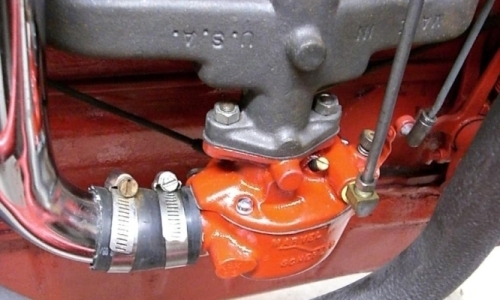 If the seat is tight, with the correct seal under it, the carb float should not require bending to get the correct height. I usually end up straightening any bending the previous rebuilder may have done. Some replacement float valves are a little taller or shorter, so if everything else checks out ok, go ahead and bend the float to get the correct 9/32" height. Changing the float height is not recommended, but if you are so inclined, remember this adjustment is being made upside down. So if you raise the float (more clearance) this will actually be a lower float setting when you flip the top over and assemble the carb. E4—Install the Main Nozzle with a gasket that looks similar to the one that went under the float seat, but slightly smaller. Snug the Main Nozzle down with the deep socket. E5—Place the venturi into the top cover gasket. 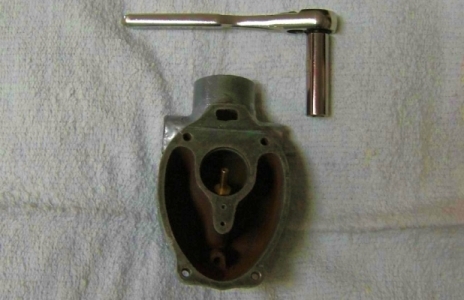 The tapered part should be at the top when the carb is assembled. E6—Once you have that figured out place the top cover on and start a couple of screws. Check the venturi again making sure the tapered part is still on top. If ok, continue installing cover screws and tighten them in stages to gradually snug the cover down. E7—If you took the shafts out, reassemble shafts, plates, shaft seals, and finally install the mixture adjustment screws. TIP:This is something that is more likely to be a problem with other vehicles, where the carb mounts on top of the engine. This is still good advice for any carb work. I've never had one of those little screws in the throttle plates come loose, but I have seen what a small screw like that can do to the inside of a cylinder. Once you have the throttle plates centered and screws tight. Flip the throttle or choke plate open. Hopefully the screws have at least one thread out past the back side of the shaft. If so, it only takes a second to crimp the screws with a pair of pliers. Sort of like setting a rivet, Pinch the screw so that last thread is slightly deformed. Now the screws cannot back out on their own. If the screws are too short to crimp, I start rummaging in my spare parts for replacements that are longer. If that isn't an option, Loctite, or even a dab of epoxy, might be used for insurance. Absolutely no way do we want to give those screws any chance to rattle loose and get sucked into the engine!